Do public places still matter in the age of the smartphone? Data-driven technologies may make cities work more efficiently, but that may not always be the only thing we want out of places, argues Western Sydney University’s Sarah Barns. You’re on the train on your daily commute, head bowed, peering at your phone. A cavalcade of news stories, friends’ holiday snaps and random promoted images of trending slippers pops up on your social media feed, which you idly push along in search of something fresh. You look up. Most of the people around you are doing something similar. 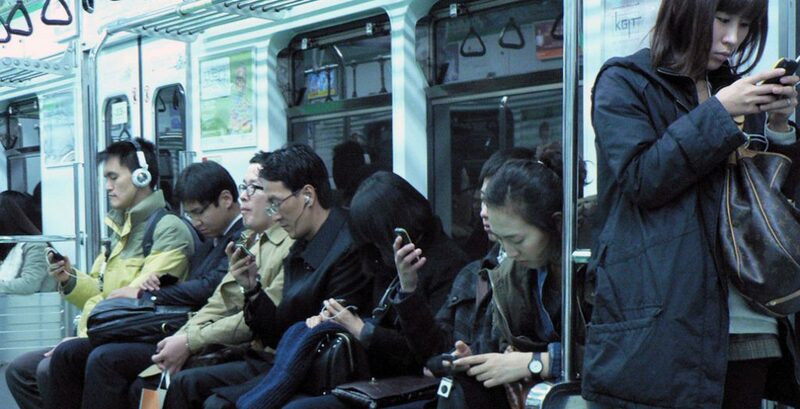 Connecting intensely with their smartphones, and not with anyone near them. It’s a scene repeated across Australian cities every weekday morning. More and more of our daily lives – how we work, how we navigate, how we learn and how we entertain ourselves – take place through the interface of glowing rectangular screens. There is concern about what smartphones are doing to our attention spans, our capacity for random human interactions and our self-esteem. But what does the age of the smartphone mean for our cities, and for how we design our public spaces? It’s a question that has intrigued tech futurists for decades. Australian-born architect Bill Mitchell trained a generation of digital urbanists at the Massachusetts Institute of Technology (MIT) to imagine and plan for the coming “city of bits”. In his 1995 book City of Bits, he likened the impact of the infobahn to that of Haussmann’s 19th-century Parisian boulevards, in their capacity to radically reshape the city. Unlike Haussmann’s network of avenues, parks and water infrastructure, the “invisible city” of the 21st century would, Mitchell argued, be shaped more by the logic of networked data. Places would be “constructed virtually by software instead of physically from stones and timbers”. “Unlike Haussmann’s network of avenues, parks and water infrastructure, the “invisible city” of the 21st century would be shaped more by the logic of networked data” – @westernsydneyu’s Sarah Barns. Mitchell wasn’t the only one who believed our digital future would dramatically reshape our cities. Media futurist Marshall McLuhan speculated in 1964 that the coming “global village” would mean that “the city as a form of major dimensions must inevitably dissolve like the fading shot in a movie”. Our need for groups of people to be near to each other, he believed, would become redundant as more and more of our connections would occur virtually. Of course, the future didn’t quite turn out that way. Vibrant, productive physical places still matter. Architects and designers are still building places of “stones and timbers”. Smartphone-equipped citizens need not be tethered to their desks to surf the infobahn. The Internet of Things (IoT) entails more and more urban services and infrastructure being connected via tiny distributed sensors. The virtual space of the internet has become increasingly interconnected with our urban fabric. 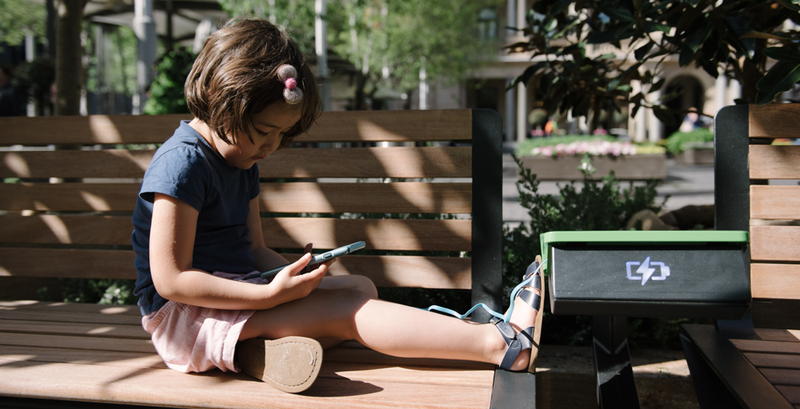 A digi-native takes a liking to a phone-charging bench in public space. Image: WE-EF. 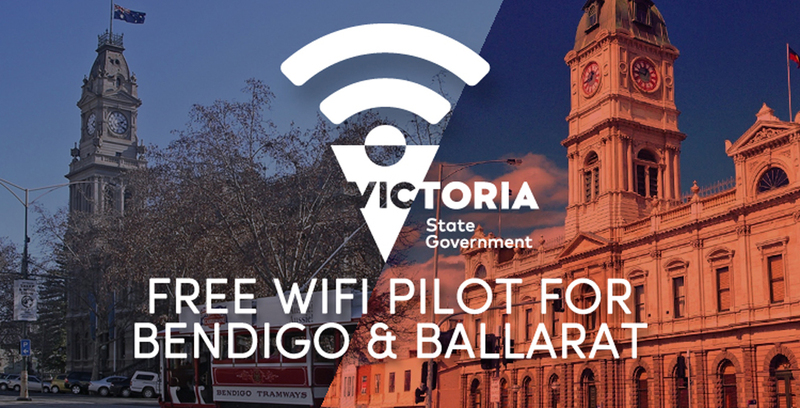 Recently, the Victorian Government has rolled out free Wi-Fi in public space across cities of Bendigo and Ballarat. The city of bits has become the city of data. The millions of daily interactions and transactions in cities – volumes of energy used; movements of people, traffic, water and waste; social media interactions; emails; financial and retail transactions; and multi-modal transport flows – are generating huge volumes of “data exhaust”. These data are increasingly being put to work in an attempt to better manage the pressures and challenges our cities face. “The city of bits has become the city of data” – @westernsydneyu’s Sarah Barns. Many hope this age of big data will lead to smarter, more responsive cities. Australian cities have begun trialling smart technologies – parking apps, smart lighting trials, public Wi-Fi – to improve basic city services. The Australian government’s A$50 million Smart Cities and Suburbs Program will help scale up these investments to allow for more ambitious trials. Many smart-city technologies are designed to help local governments better monitor services such as waste collection and roads maintenance. For example, the Western Australian city of Joondalup is partnering with Telstra to test IoT technologies to better monitor environmental factors like temperature, humidity, pollution, light and noise levels in real time. The recently released Smarter Planning Perth (SPP) map allows government agencies and utilities involved in infrastructure works to better collaborate, share costs and co-ordinate timetables. This is a platform designed to minimise works congestion and cut project time frames, so the city’s road networks run more efficiently. But what kinds of places will these smart technologies and services actually create? With a focus on data analytics, efficiency and automation, there is no guarantee that the latest data-driven technologies will necessarily help our public places thrive. Just as likely to reduce our life expectancy and social engagement by making it easier to order high- fat, high-sugar takeaway food on our smartphones to be delivered to our couches by drones whilst we immerse ourselves in multiplayer virtual reality games. Data-driven technologies may make cities work more efficiently, but that may not always be the only thing we want out of places. One of the great lessons of the past two decades is that, despite our growing dependence on digital platforms of communication, spaces that enable us to connect and mingle in real life still matter. Our enduring connection to places of “stones and timber” surely reflects our all-too-human desire not only for seamless interfaces and swipeable apps, but also for places of disturbance, delight, random noises and chance encounters. As the US urbanist Jane Jacobs observed many decades ago, good places are nourished by diversity and difference, not uniformity and efficiency. We need, therefore, to ensure the new-found insights generated by all of our cities’ data works in the service of good places. How can this be done? For a start, putting data to use may lead to a very analogue solution. For example, more fine-grained urban data that alerts us to temperature anomalies in different places should be used not only to monitor, but also to cool. 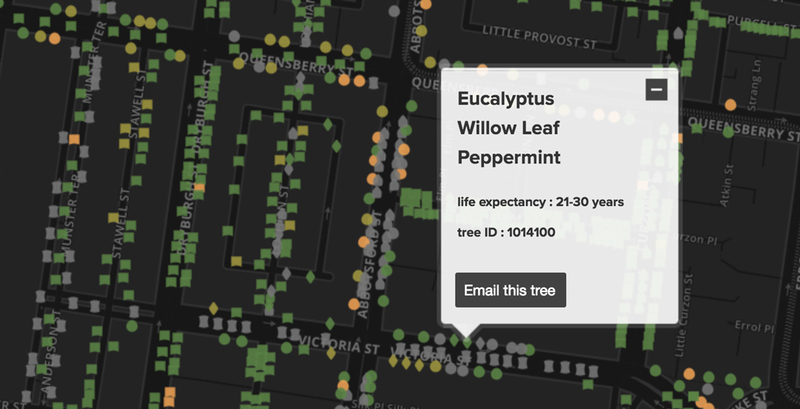 This means more trees, not just more sensors. Many cities have begun to design smart bus stops equipped with heat-responsive water misters and blinds, so these become places of respite and shelter for weary travellers. This approach uses digital technologies to artificially “switch on” natural services like water-cooling and shade in places that have, as a result of the use of materials like bitumen and concrete, become urban heat islands, exposing some of our most vulnerable to extremely hot conditions. Digital technologies can also help us navigate and experience places through the events and characters that have shaped their unique identities. Digital overlays, soundscapes and augmented media can provide us with interactive experiences of the the built environments of today and their past “lives”. “Digital technologies can also help us navigate and experience places through the events and characters that have shaped their unique identities” – @westernsydneyu’s Sarah Barns. These uses of technology allow for different, perhaps more intimate, interactions between people and places. Crucially, augmented experiences of the history of a place can help us recover what has been lost through decades of urban transformation. Digital technologies can also be used to disrupt official narratives of place. At Sydney’s Waterloo public housing tower, slated for demolition in a new phase of urban renewal, community artists worked with public housing tenants to create a large-scale digital artwork that expresses the residents’ emotional connections to their homes. Image: Feeling blue: Waterloo towers resident Fiona in her apartment (author provided). Embedded digital technologies were used to subvert the usual mechanistic processes of community consultation managed by development agencies. The spectacular piece of digital art worked to highlight that residents should not be forgotten in the renewal process. Clearly, the possibilities of digital technologies can be used to confound and enlarge our experiences of and connections to place. As McLuhan and Mitchell would no doubt have realised by now, with the rise of digital technologies public spaces have become more, not less, important to the experience of cities. As we design the digital interfaces and data-driven services to support our places and spaces, the evolving possibilities of place and digital publics will no doubt continue to surprise. This article first appeared via Future West, co-published with The Conversation.